Enjoy this selection of some past Alliance webinars. Click each webinar title for more information and to buy. Upon successfully paying for your order you will receive two emails: one is a confirmation of your order and the other has a link to download a PDF with a link to view the webinar. Any supplemental materials required for the event, such as workbook pages or other handouts, are available to download from the webinar playback page. What Really Happens After You Push SUBMIT on Your Proposals? FREE Webinar (recorded 9/17) - Click here for more information about merchant services member savings. FREE Webinar (recorded 06/18) - Click here for more information about unemployment insurance member savings. This webinar series can assist interested or registered organization by answering most of their questions. Click on a link below to view the recording. 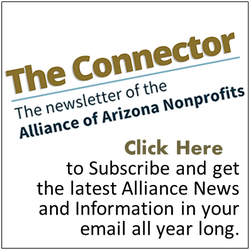 Webinar 6: Cultivating Donor Relationships After Arizona Gives Day Download Handout HERE.